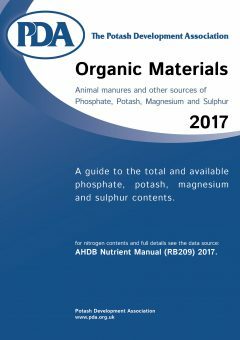 A guide to the total and available phosphate, potash and magnesium contents of some manures. Typical phosphate, potash and magnesium contents in some animal and other organic manures. These can be used as default contents in the absence of actual measured or declared values. (1)Nutrients available to the next crop (kg/tonne of product, not %). (2)See below for sulphur availability. (3)Potash values will be lower if FYM is stored in the open for long periods. (4)Adjust nutrient contents if % DM is higher or lower. To convert kg/t to units/ton, multiply by 2. To convert kg/m3 to units/1000 gallons, multiply by 9. Organic materials contain valuable amounts of crop-available sulphur and recent research has quantified sulphur supply from livestock manures and biosolids applications. Sulphur from autumn applications may be lost via overwinter leaching. The quantity leached will depend on soil type and overwinter rainfall and is likely to be higher on light textured soils in high rainfall areas. The nutrient content of organic manures on farms vary widely and so it is better to have a laboratory analysis carried out to get the correct values specifically for the farm and the year in question. However, it is important that the sample taken for analysis is truly representative. This means that sampling should be undertaken according to the protocol given in the AHDB Nutrient Management Guide (RB209), Section 2 Organic Manures. In the absence of a recent analysis, and where thorough sampling can not be done, these typical values represent an alternative for nutrient planning purposes.